Hello Everyone! Happy Monday and I hope you all had a restful and amazing weekend. This weekend was definitely amazing for me. This past weekend my sister arrived in town from Vancouver for a bit of a visit, and she got in the same morning of the Gingersneezes run club 10k race. So not only do I get to spend some time with my sister I had her in my cheering section during the race which was pretty phenomenal. Back in April I had started up the Gingersneezes run club, to help build a little running community, and to hopefully help show people who really don’t consider themselves runners that anyone can be a runner as long as they are willing to lace up their shoes and put in some effort. 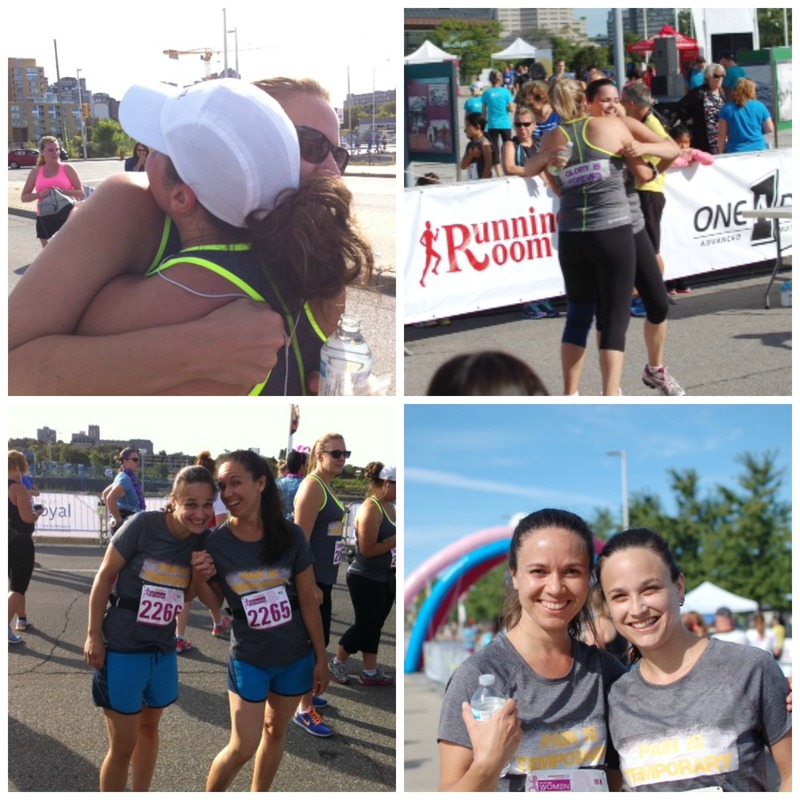 With the help of my running buddy Susan we started the Gingersneezes run club, we built a community where no matter what your skill level, pace or experience you would be supported and encouraged to keep on trying. This past weekend each of the 5 women that joined had the opportunity to show themselves that they really are a group of runners. We had all signed up for the Shoppers Drug Mart Run for Women and Susan and I made sure to ensure the training the run club was doing would help everyone succeed. Having done the route before in other races I was sure to incorporate hill training (it was one of those nasty routes where they put a substantial hill right at the end of the race) and various strength training exercises in the weekly routine. Each of the run club members were dedicated to showing up every week for our group runs and were even more committed to making sure they scheduled in their weekly solo runs. Leading up to the race there were nerves and doubts, but the closer the race came the more excited the run clubbers became. 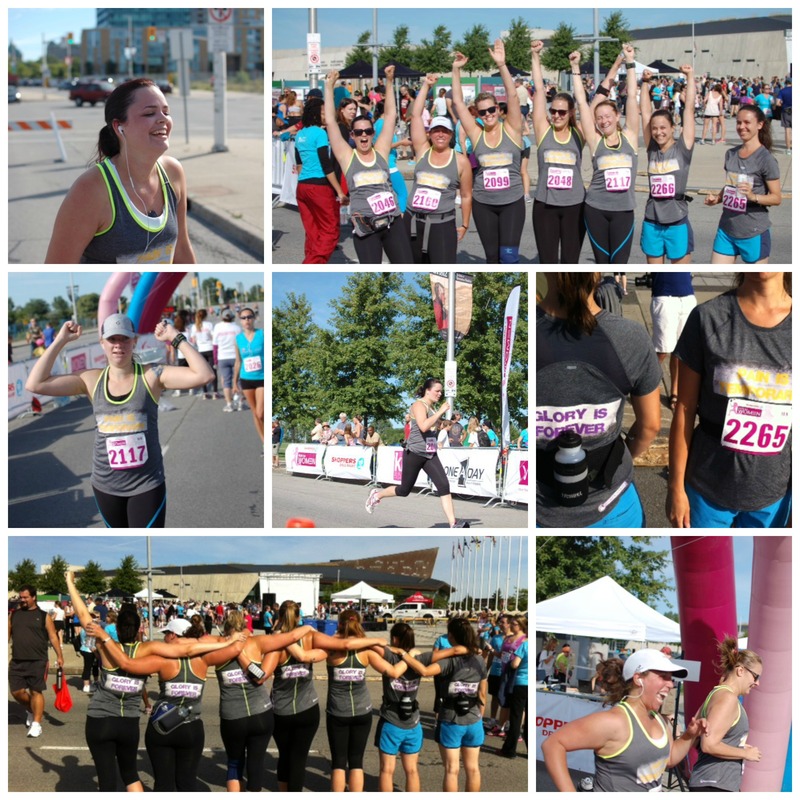 Each of the run clubbers were encouraged to set some goals for themselves for their first 10k race and were also encouraged to pick a partner to run the race with. I am beaming with pride to say that each of the run club members smashed the goals they had set for themselves and far exceeded any expectation I had had for them. All in all it was a pretty amazing morning of huge accomplishments for everyone! On a personal note I set a PR for myself finishing in 51 minutes and 52 seconds and came in 28th out of 261 participants. My initial goal was to finish in 55 minutes so coming in almost 4 minutes under my goal felt pretty great. After everyone had wrapped up their race and a plethora of photos were taken by our cheering section we all headed home to get cleaned up before our celebratory BBQ. We all gathered back up to share stories of our race and look at some of the pictures that were taken that morning. 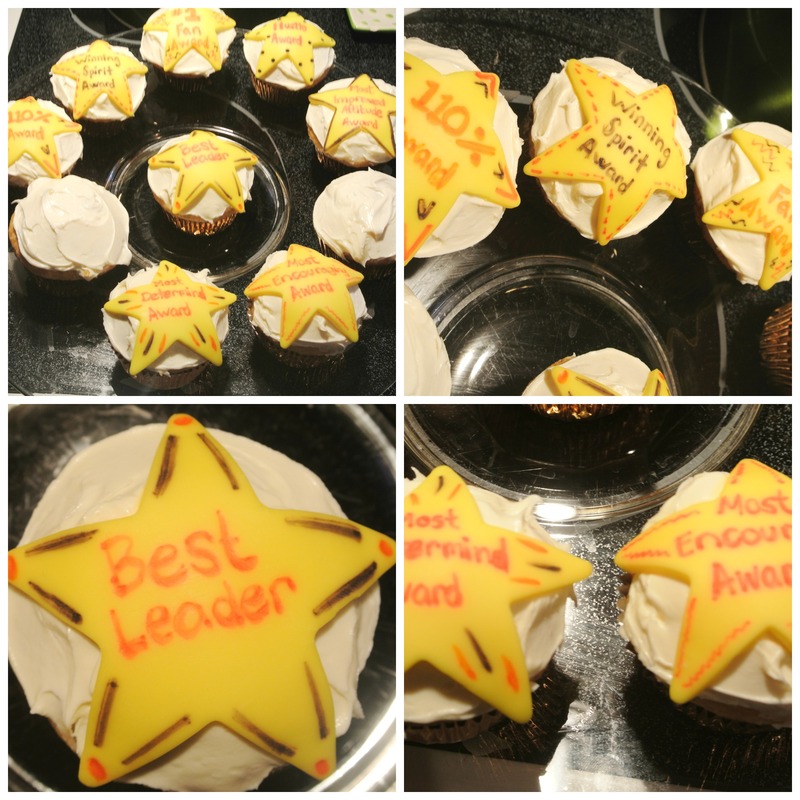 After the main meal Susan and I presented our runners with medals in the form of cupcakes commending each of them on their hard work and progress over the past few months. We may have all reached our goal of completing the 10k race but that does not mean that the run club is finished. Gingersneezes run club will be starting up for a second session beginning September 9th. So if you can run about 5k and are interested in working on endurance and speed drop me a line to join. Just click on this link and let me know you are interested. Happy Monday everyone. Have a great day. 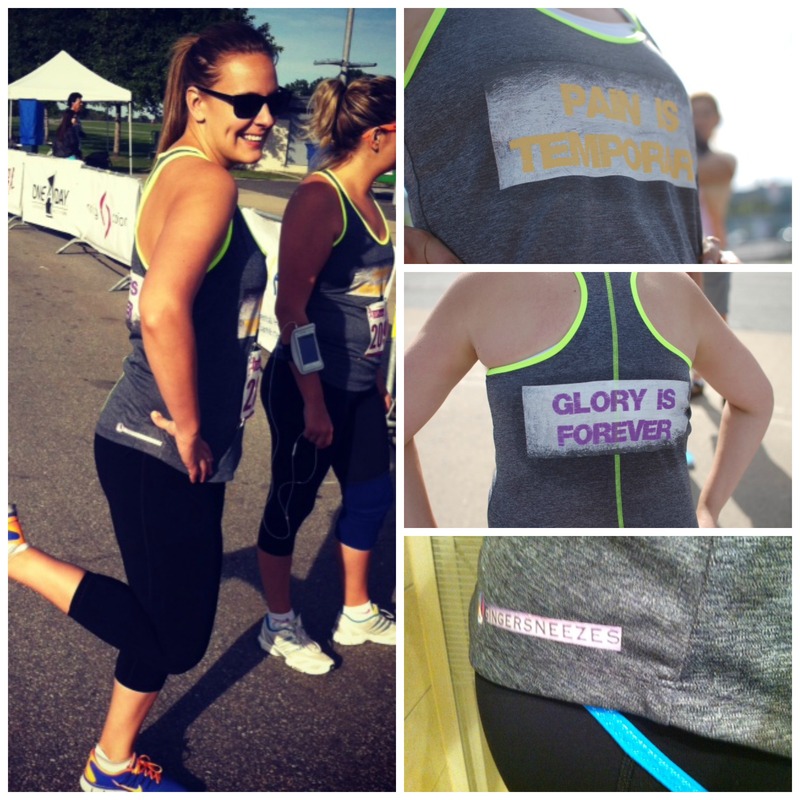 This entry was posted in General and tagged 10k, accomplishment, BBQ, Goals, health, healthy-living, PR, race, run club, success, weekend, women run by healingginger. Bookmark the permalink. Signing up for your run club was the best thing I could’ve ever done!!! I am so proud of completing my first ever 10k. It is through your and Susan’s amazing encouragement, support, training plan, and running/stretching tips that really helped me finish this race! And of course, knowing that I was amongst 4 other girls who like me, never thought that running could be part of something they actually enjoy and look forward to, really made me feel like we were all in it together! I am so happy it has been such a happy positive experience for you! Congrats on the run.